The First Amendment provides U.S. citizens the right to receive information and ideas through the freedom of speech and freedom of the press. Throughout history, this important legal principle appears in various contexts — the arts and libraries have produced notable examples. However, one area in which this principle does not align with these freedoms is an individual’s right to know when seeking federal records, a tenet that came nearly two centuries later in the Freedom of Information Act, or FOIA. A person’s right to receive information and ideas and an individual’s right to ask for federal records are different — and court decisions have reflected this observation. The First Amendment does not explicitly grant an individual the constitutional right to government information. 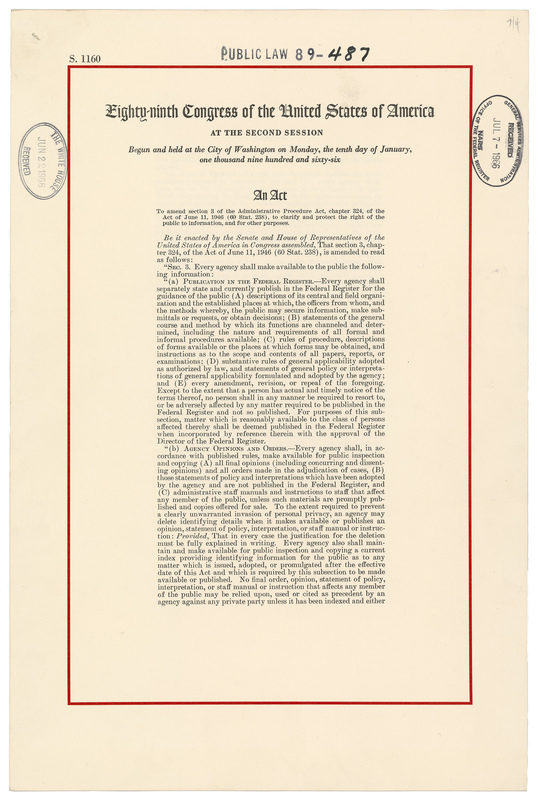 When the Freedom of Information Act was enacted in 1966 to give the public the right to ask for records from any federal agency, the intent was to enforce the First Amendment’s “right to know.” Although the Supreme Court has determined that this right, in some respects, is protected implicitly by the First Amendment, the case of Houchins v. KQED, 438 U.S. 1 (1978) concluded otherwise. The Court ruled that an individual’s right to know does not expressly suggest access to federal information. Despite FOIA and subsequent federal and state sunshine laws, the ideals of transparency continue to be argued in the courts. Journalism’s mission is to inform the public, primarily through its role as a governmental watchdog. The First Amendment, in an overarching way, helps the news media to accomplish this primary function through the help of federal and state sunshine laws. In this essay, recent legal challenges to transparency are discussed broadly through the historical lens of the right-to-know. This essay also argues how the FOIA and state laws should be re-examined as the fight for an open government is more significant than ever. While the “right to receive information and ideas” is inherent in the First Amendment, an individual’s right to know is treated as a separate concept and is not explicit in the constitutional law. In fact, the courts do not interpret the First Amendment to include the public’s right to know. For this reason, Congress enacted the Freedom of Information Act in 1966, opening up government files for citizens and the press. Consequently, however, the federal statute gives the courts the power to decide in legal fights involving the First Amendment, arguably reducing its constitutional value. Yet, a decade later in 1976, Congress enacted the Government in the Sunshine Act, commonly known as the Sunshine Act, when the Watergate scandal created the need for increased government transparency and accountability. Sometimes referred to as the Open Meetings Act, this federal law recognizes the public’s right to know, specifically articulating decisions that affect the public are open and accessible to the public. Decades after FOIA and the Sunshine Act, legal battles over various tenets of open government laws continue against federal and state governments, which increasingly seek to cloud the skies with dark traces of secrecy. Such conflicts can tell a great deal about how the administrations at the helm of these governments comply with or regard freedom-of-information requests. The Associated Press, in a 2018 news analysis, reported that the federal government censored, withheld, or said it couldn’t find records sought by citizens, journalists, and others more often in 2017 than at any other time in the past decade. This report covered the first eight months of Donald Trump’s tenure as president. Sunshine laws also are under attack at state levels. Throughout the United States, lawmakers are seeking to reduce the power of the public’s right-to-know in sunshine laws by changing language to limit public accessibility to an open government. This can be damaging for both the citizens and the local news media. For instance, in Kentucky, House Bill 387 — if passed in 2019 by the General Assembly — would limit severely the access to public records that relate to economic development, procurement, and business transactions between the state government and private businesses. Written by members of Gov. Matt Bevin’s administration, the bill arguably is a retaliatory response to recent court decisions that ordered the disclosure of public records after The Courier-Journal in Louisville filed the requests to access the records. The Kentucky Open Records Act requires state government agencies to hand over records and documents regarding business investments and related activities that are part of a final agency action. HB 387, however, would exempt every record pertaining to economic development from public disclosure. The damage would spiral to other implications that would lessen the law’s power to strive for transparency or would enable public agencies to oversee themselves. The First Amendment, the Freedom of Information Act, and the sunshine laws that exist in every state work differently to protect a public right. While lawmakers appear busy to close the door on accountability and transparency by drafting bills such as the one in Kentucky, state press associations and other open government scholars must work strategically with news outlets to examine the laws in their states, determine where improvements are needed, and lobby for them. March 10-16, 2019, is National Sunshine Week, which could make a perfect opportunity to launch such collaborative endeavors. Appealing or suing is a way for public agencies to delay and deny access to government information. Lawsuits, however, are expensive and take time — and that’s time taken away from meaningful public business and money out of citizens’ pocketbooks. The public interest is served when efforts are grounded in accountability and transparency. Any kind of administrative order or proposed legislation that challenges the nexus of these concepts, thus the public’s right-to-know, must be defeated. About the author: Dr. Melony Shemberger is associate professor of journalism and mass communication at Murray State University in Murray, Kentucky. A former newspaper journalist who specialized in court and education news reporting, she teaches students how to use Kentucky’s sunshine laws as part of their newsgathering and reporting efforts and has conducted workshops to help public officials understand these laws from a journalist’s perspective. David L. Hudson Jr., “Right to receive information and ideas,” The First Amendment Encyclopedia, accessed January 2, 2019. Cases involving the arts and libraries are cited as examples. Barry Sullivan, “FOIA and the First Amendment: Representative Democracy and the People’s Elusive ‘Right to Know,’” Maryland Law Review 72, no. 1 (2012), accessed January 11, 2019. Ted Bridis, “U.S. Sets New Record for Censoring, Withholding Government Files,” (March 12, 2018), accessed February 22, 2019. Sunshine Week, observed every March, is organized by the American Society of News Editors and the Reporters Committee for Freedom of the Press. Copyright © 2019 AEJMC History Division. All rights reserved.